A plaque commemorates association of the Australian Customs Service with the wharves and warehouses of the Sydney waterfront. A pathway on this site gave customs officers access to Sydney Cove from the Customs House, which was located in the Argyle Stores from 1830 until the opening of the Circular Quay Customs House in 1845. 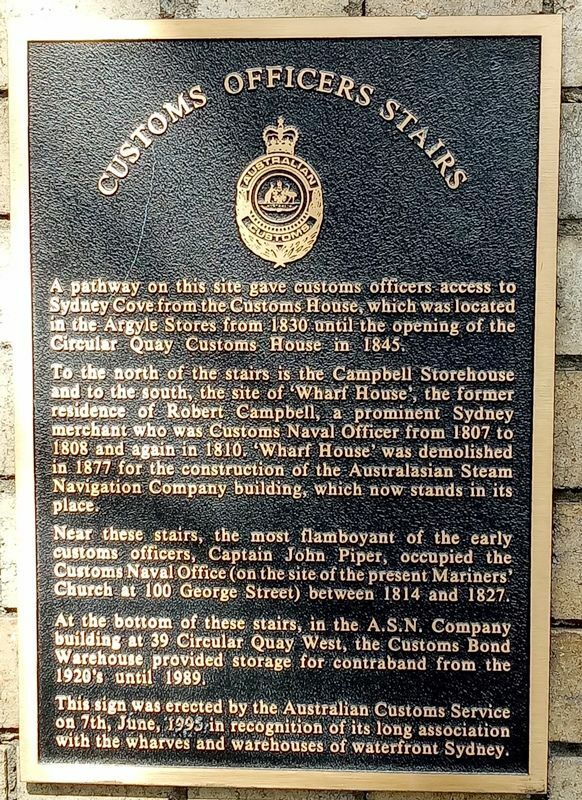 To the north of the stairs is the Campbell storehouse and to the south, the site of `Wharf House`, the former residence of Robert Campbell, a prominent Sydney merchant was was Customs Naval Officer from 1807 to 1808 and again in 1810. `Wharf House` was demolished in 1877 for the construction of the Australasian Steam Navigation Company building, which now stands in its place. Near these stairs, the most flamboyant of the early custom officers, Captain John Piper, occupied the Customs Naval Office (on the site of the present Mariners` Church at 100 George Street) between 1814 and 1827. At the bottom of these stairs, in the A.S.N. Company at 39 Circular Quay West, the Customs Bond Warehouse provided storage for contraband from the 1920`s until 1989. This sign was erected by the Australian Customs Service on 7th, June, 1995, in recognition of its long association with the wharves and warehouses of waterfront Sydney.